The German Luftwaffe used 3 Jetstar between 1963 and 1986. The 11 + 03 was flying under the colours of the 2. Fliegenden Staffel der Flugbereitschaft des BMVg based at Köln-Bonn. The picture was taken in 1976 when the 11 + 03 took off from Brussels National Airport after visiting the 15th Transport Wing. After his military career the 11 + 03 was sold on the civilian market. The first civilian owner was Zarkani Aviation Services-Airline of Egypt and the registration was SU-DAH as from January 27, 1987. On June 15, 1996 the plane was bought by a private owner of the Sudan Republic and became the ST-PRE. The current status indicates that the plane has been scrapped. The plane was built in 1969 and delivered to Seaboard World Airlines on March 28, 1969. The plane was registered N8638. Between April 11, 1973 and March 18, 1974, the plane was leased to Korean Air Lines. Back to Seaboard World Airlines, it was sold to the Gabon Government and became TR-LTZ on November 27, 1974. 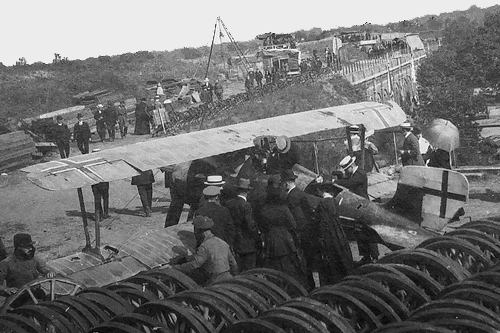 The plane was named : "Franceville". In 1982 the plane was modernized and was fitted with new CFM-56 engines. 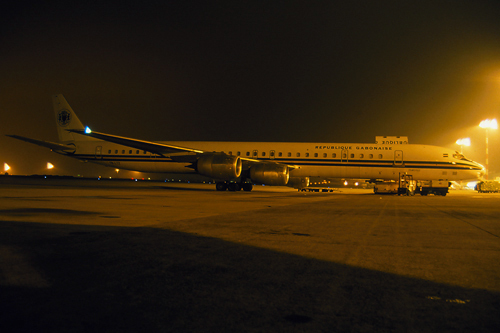 The plane is pictured during a night at the cargo side of Brussels National Airport in the summer of 1987. On April 13, 1988 TR-LTZ was victim of a missed take-off accident at Frankfurt International Airport without victims. The plane was repaired and was still airworthy until 2004 when the plane was definitively stored at Nimes. The plane was destroyed after 2014. 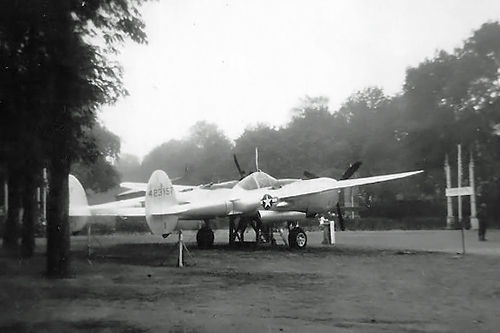 The plane with serial 42-24391 was delivered to the Army Air Force in September 1943. Between October 1943 and August 1944, the plane was operated by the 8th Troop Carrier Squadron under the command of the 12th Air Force. After the war the plane was bought by the French authorities and from September 1949 used the SGAC (Secrétariat Général de l'Aviation Civile) with the registration F-BEIG. In 1978 the plane was sold to Mister Audrey and leased to various companies. The first user was Bretagne Air Service and later on, in 1981, Normandie Aero Services. In 1984 the plane was flying for Stellair and named "Le Petit Prince". In 1989 the plane was bought by a Belgian team. Their project: paint the plane in Sabena colours (OO-AUL) and carry out pleasances flights. But in Belgium, it's quite impossible to register a historical aircraft other as a usual transport aircraft. A few months later, in 1992, a new Belgo-Luxemburg company was created, and Legend Air was born. The plane was registered LX-DKT but was seriously damaged during a thunderstorm at Oostend and the plane was definitively grounded. In 2011 the plane was bought for a symbolic Euro by the Dakota Historical Center and is now restored in the Belgian Air Force colours as OT-CWA. 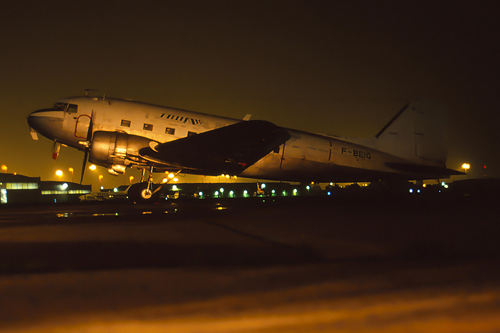 F-BEIG was pictured at Brussels National Airport during a summer night of 1990. This plane was built in 1972 and delivered to Rothmans International Limited on April 21st, 1972. The Pitts S-2A was the replacing aircraft of the Stampe & Vertongen SV-4 of the team who started their displays in 1972. 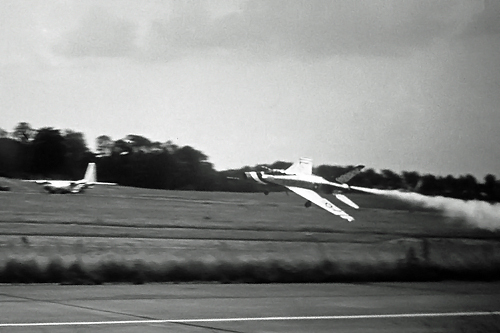 The team was performing their first Pitts display season in 1973. 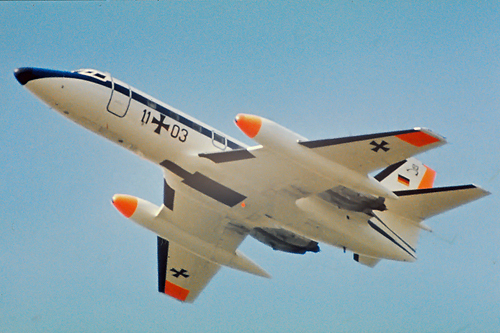 G-BADX was pictured during the Goetsenhoven airshow in 1976. Sadly, two years later G-BADX of the Rothmans Aerobatic Team crashed during an aerobatic display, at Lanzarote, Canary Islands. The pilot George Smith was killed. The registration G-BADX was cancelled on June 23rd, 1978. 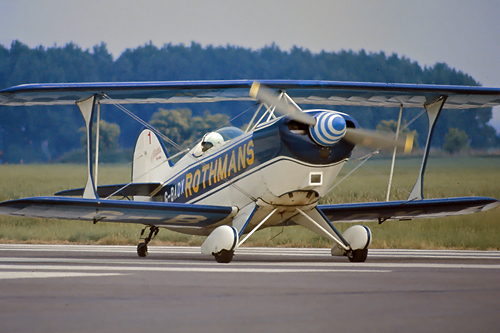 The Rothmans Aerobatic Team performed their routine from 1972 to 1980, when Rothmans International Limited decided to move their sponsorship money into Formula 1 motor racing but although they continued to sponsor a single Pitts S-2A until 1982. Most of the pilots of this unique 1970's team were former RAF pilots from all horizons. The plane C/N 080/312080 was delivered to the Royal Air Force on November 29th, 1978. 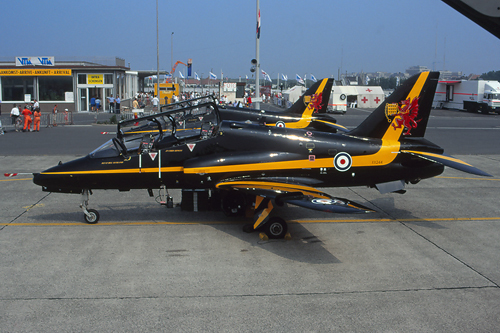 The XX244 was pictured during the Oostend airshow held on July 29th, 1995 in company of his brother of arm the XX235. This was at that time the official RAF Hawk Demo from RAF Valley (Dragon logo on the tail). Currently the XX244 is one of the Red Arrows aerobatic team aircraft. This plane was built in 1969 and received the C/N 3131/0062. The aircraft was pictured at Beauvechain airbase on June 20th, 1984. The plane wears the colours of the 19 Squadron (Possunt quia posse videntur : "They can because they think they can") based at that time at RAF Wildenrath in Germany. The plane ended his career at RAF Watisham and was scrapped from the RAF fleet in March 1992. This aircraft is pictured after the First World War (around 1919) in Charleroi area. No numbers can be seen on the picture as they are normally in the dark part of the tail fin. The plane still wears the German markings and dazzle camouflage. If any reader recognizes the location with this railway bridge under construction, the information is always welcome. This picture was taken during the Brustem Airshow of 1965. The solo, Capt. Robert Morgan (Six) is making a low level pass with the gear down. Capt. Robert Morgan was killed during a flight at Indian Springs Auxiliary Field in Nevada on October 12th, 1966 during a mid-air collision with Maj. Frank Leithen also killed in the accident. The plane was built in 2004 and was registered as NX215EX. The plane was delivered to Aircraft Guaranty Title & Trust LLC on February 5th, 2004. The plane moved the same day to General Maritime Corporation. Later on the plane was sold to Aircraft Guaranty Title & Trust LLC on April 21st, 2005. 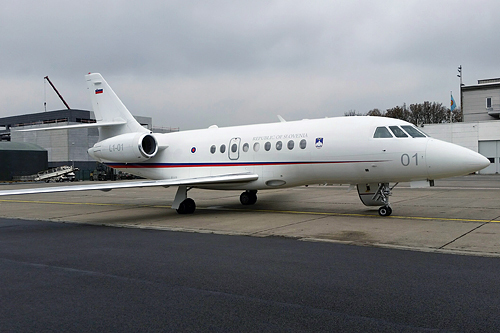 The plane was bought by the Slovenian Republic government on August 20th, 2009 and got S5-ABR as registration. On February 13th, 2013 it was assigned to the Slovenian Air Force with the military code L1-01. The Slovenian Falcon was visiting the 15th Transport Wing at Melsbroek on November 14th, 2016. This plane was built in 1998 and was registered N1786B. After some flights for the Boeing Company, the plane was acquired by TAG group and with the code VP-BRM on July 14th, 2000. The Nigerian Government was interested to buy the plane and she joined the governmental fleet on August 28th, 2014. 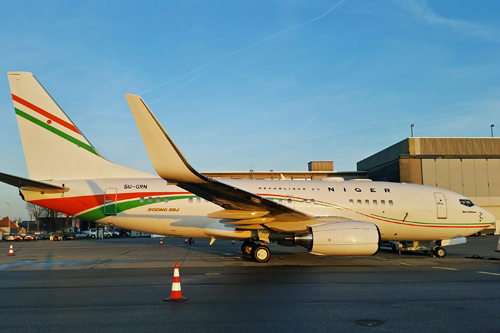 The plane is registered 5U-GRN in the national colours of the Niger Republic. The plane is seen at Melsbroek airbase on December 15th, 2016. 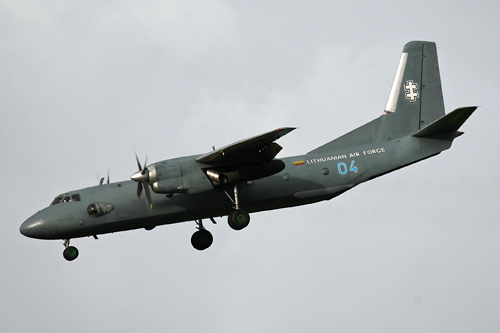 The Lithuanian Air Force used three Antonov 26 Based at Vilnius. 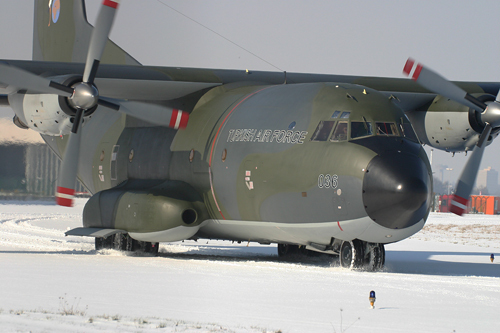 The plane was part of the 277th Transport Squadron and is pictured at Brussels Airport on December 1st, 2007. The old soviet era AN26 is now replaced by the C-27J Spartan. (Maximas Air Cargo) and is still airworthy today. 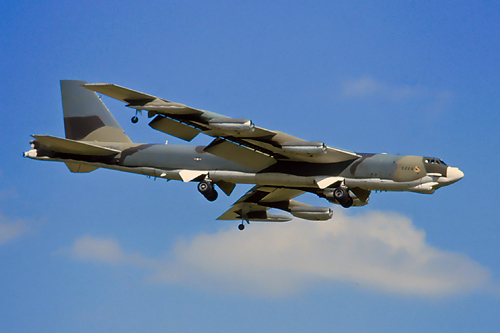 This "buff" was visiting the Chièvres Airshow in June 1984. The plane took off from Loring AFB (Maine) with objective the Shape base and then flight back to his home base. Later on the 0226 took part of the first wave of the Gulf War in 1991. His nickname was "Wreckin Crew". "Wrecking Crew" remained at Jeddah until the end of hostilities and then returned to the 42nd Bomb Wing, Loring AFB. After his career, the 58-0226 was transferred to Davis Monthan. 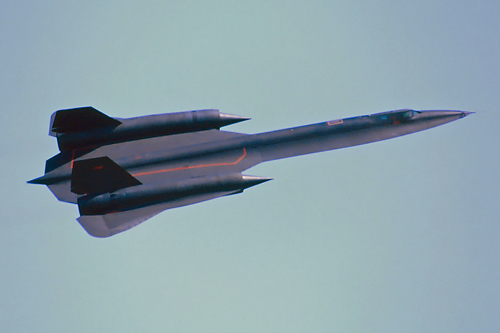 This SR-71 " Blackbird" flew his missions out of Mildenhall Air Base between April 1976 and January 1990. Operated by the 9th Reconnaissance Wing of the USAF, the plane is seen during the Chièvres Airshow of June 29th, 1986. After his military career the 64-17980 was transferred to Dryden Flight Research Center (NASA) at Edwards Air Force Base for high speed flight research. Its NASA code was "844". Afterward the plane was placed at base entrance as gate guard. 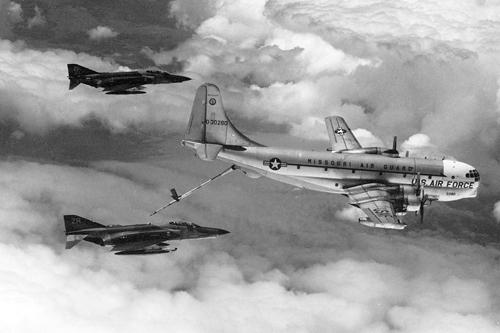 More than 200 F-5A/Bs and NF-5A/Bs were bought from various countries. Between 40 and 50 of them were upgraded to F-5/2000 standard during the 2000's. A total of 23 F-5/2000 remain active of which 10 F-5A and two F-5Bs belonging to the Turkish Stars aerobatic display team. In 2011 20449 was still airworthy and was one of the oldest F-5 in service. Zoersel Warbirds airshow on September 5th, 1993. This aircraft was one of the support aircraft of the Swedish Air Force aerobatic team "Team 60". The team is based at the Central Flying School at Ljungbyhed AFB in southern Sweden. 60108 ended his career as the Ljungbyhed airbase gate guardian. Built in 1977 the plane made its first flight registered as G-BFCM. 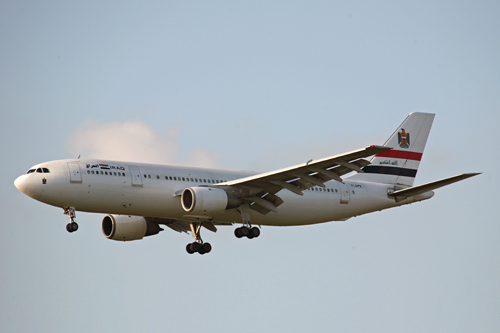 Owned first by Alia as JY-DCA in 1980, than by the Royal Jordanian Air Force as JY-CAA. This plane was regularly used as a support aircraft for the Royal Jordanian Falcon Team or the Jordan Free Fall Team. Pictured at the Sanicole Airshow in 1990. After its Jordanian career in 2000, the plane was sold in Uganda and owned by the Kampala Aeroclub as 5X-EMM as from December 2004 on. 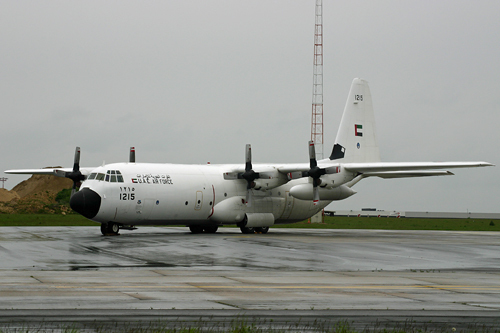 In 1979 two aircraft were accepted by the Canadian Armed Forces, who needed them to transport high ranking passengers and freight around Europe. These aircraft received the Canadian Forces designation CC-132 and were delivered to 412 Transport Squadron at the Canadian Forces Base at Lahr, West Germany. The two aircraft differed in seat configurations. The first (Miss Piggy) had 36 seats, while the second (Harvey) 47. In April 1987 the two CC-132 were replaced by another pair of de Havilland products, the CT-142 (Dash 8). Pictured at Chièvres in 1986. 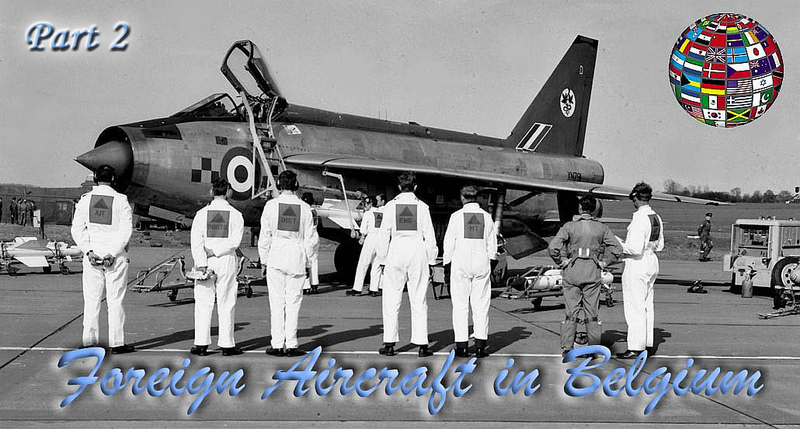 This Royal Air Force aircraft was based at Geilenkirchen airbase between 1956 and 1961. 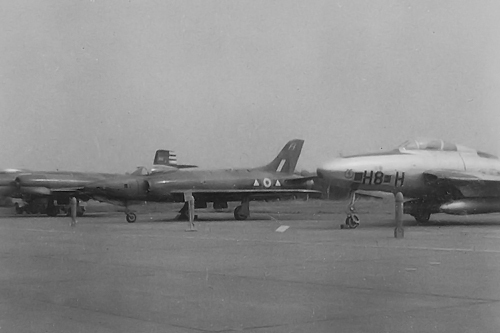 In static display during an airshow in the late 1950's near a Belgian 42 squadron RF-84F Thunderflash (FR8) and a Royal Canadian Air Force 445 squadron CF-100 Canuk. 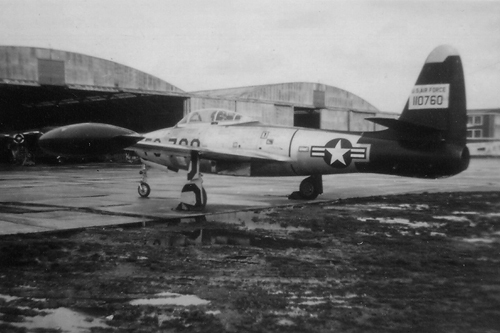 Seen at Melsbroek in 1952 during the transfer flight from Kansas ANG 127th FBS - 137th FBW to the 493rd FBS - 48th FBW based at Chaumont (FR) since May 1952. Later in 1952 the squadron was deployed for one of the regular training session at Wheelus AB, Libya. FS-760 was lost in a fatal crash on August 23rd, 1952. Third customer after Italy and Germany, the Portugal received its first G-91 in 1961. Portugal finally phased out the last of its G.91s in 1993. 5452 visiting Kleine Brogel airbase during an open door in 1991. This Lighting was exhibited in the Brussels park after the liberation. Mission immortalized by the Belgian Air Force 42 Recce Squadron. The Sikorsky VH-60N White Hawk is a special variant of the UH-60 Blackhawk used for transport of the President of the United States. This kind of helicopter is in use with Marine Helicopter Squadron One (HMX-1 ) since 1989. 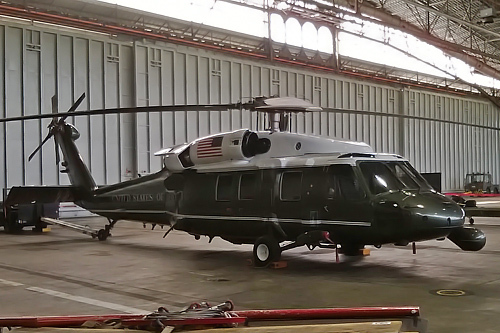 The helicopter is seen here in a Melsbroek hangar during the US president Brussels G-7 visit on June 4th and 5th, 2014. The Boeing E-4 Advanced Airborne Command Post, with the project name "Nightwatch", is a strategic command and control military aircraft operated by the United States Air Force. 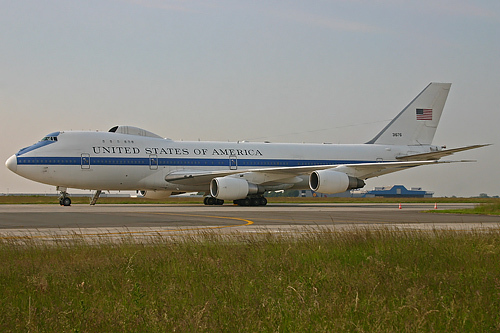 The E-4 series was specially modified from the Boeing 747-200B. The four USAF E-4Bs are operated by the 1st Airborne Command and Control Squadron of the 55th Wing located at Offutt Air Force Base. The plane is seen at Brussels National airport on July 6th, 2006. The plane is from the 221 Filo and is a former Luftwaffe aircraft (50 + 28). and is still in service.